Published January 21, 2019 By Anna T. This post may contain affiliate links. Regardless, I only recommend sites I've researched and/or used and trust. Lots of work-from-home jobs promise the world, but end up under-delivering. They may sound good when you visit their website and read the recruiting material, but once you start working a plethora of problems show up unexpectedly. Maybe they don't give you enough hours, or there's less schedule flexibility than promised. Sometimes the management style is terrible, and you spend your days worrying you'll be fired over some tiny mistake. One of the best ways to avoid these issues is to visit a site like Glassdoor.com, and check the ratings and reviews of jobs before you apply. You can find all kinds of information by reading the comments there from former employees, including a lot of stuff that isn't necessarily listed in any of the official hiring literature. But there are thousands of jobs listed on Glassdoor, and If you're new to the work-at-home scene, you probably don't have any idea where to even begin. 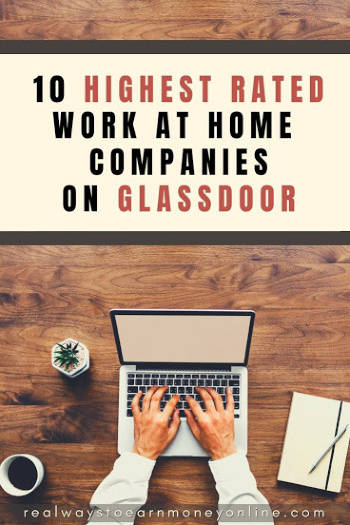 With these difficulties in mind, we made this list of legit work-at-home-jobs with Glassdoor ratings of 3.5 or above. And of course be mindful these numbers can change over time. Hopefully you'll find something here that interests you, but even if you don't, you'll have a better idea of what to expect from high quality work at home jobs, which will give you a basis for comparison when considering future opportunities. This company hires work at home chat agents to handle all sorts of tasks, including customer support and sales. The pay rate is only about $10 per hour, but people seem to really enjoy the work, and the flexible hours are a big plus. Go here to apply at The Chat Shop or read our review of The Chat Shop first. This is one of the easiest language tutoring jobs to get. You don't need any special certifications, and the work itself is fairly simple to do. You'll basically be chatting with people in ordinary conversations, giving them a chance to practice their English. The pay maxes out at a little over $10 per hour, but you can pretty much work whenever you want, and most people don't find the job particularly stressful. Go here to apply at Cambly or read our Cambly review first. If you have some sort of teaching experience (it can be something informal, like mentoring) and a bachelor's degree in any field, you might want to take a look at this language tutoring job. You'll be giving English lessons to Chinese students. The pay is about $16 per hour, on average. Go here to apply at VIPKid or read our VIPKid review first. People seem to love working for this social media management firm. You'll be a moderator, assigned to one of their client companies, helping them manage their official Facebook, Twitter, Youtube, Pinterest, and etc… The pay can be pretty good, and if you stay on for a while, there's a certain amount of upward mobility. Go here to apply at The Social Element or read our review of The Social Element first. The Glassdoor rating may not look all that great compared to some of the other jobs on this list, but this is a phone job, and those tend to take it on the chin when it comes to user reviews. This is actually one of the higher rated call center services out there, and part of the reason is the pay rate. Depending on which projects you get set up with, you could end up making as much as $30 an hour. Go here to apply at Working Solutions or read our Working Solutions review first. If you want a job where you'll get a chance to make a real difference in people's lives, you might want to check out Aira. They're the makers of special eyeglasses for the blind, equipped with video cameras, speakers, and a microphone, all of which are wirelessly connected to the internet. Agents look through the cameras from their computers and give real time information to the wearer about what's going on in the environment. Basically, you'll serve as a borrowed set of eyes, and your job is to help people navigate their day-to-day challenges. The pay is about $15 hourly, which isn't too shabby compared to a lot of other online service jobs, and many people find the work extremely rewarding. Go here to apply at Aira or read our Aira review first. This is one of the better rated transcription services. The pay isn't really that great ($10 per hour on average) but they apparently keep workers fairly busy most of the time, and you have a degree of flexibility when it comes to scheduling. Go here to apply at Net Transcripts or read our Net Transcripts review first. One of the best places to get hired as a virtual assistant. The pay is only around $11 per hour, but workers love the schedule flexibility, and the work itself sounds fairly interesting. This is one of those cases where the glowing reviews really speak for themselves. Almost everyone seems to be fully satisfied with just about every aspect of this job. Go here to apply at Time Etc. or read our Time Etc. review first. Another virtual assistant service. If hired, they'll set you up with clients whose needs match your existing skills. According to reviews, the management is extremely supportive, the starting salary is $20 per hour, and you get paid vacation time. Go here to apply at Worldwide 101 or read our Worldwide 101 review first. This is a writing opportunity. You'll be doing SEO content, working (for the most part) on your own schedule. Apparently the editors are great to work with, and it's pretty easy to learn the basic guidelines. Some people earn close to $20 per hour, but you'll have to write fast to get to that level. Go here to apply at BKA Content or read our BKA Content review first. Finding a good legit work at home job can be a messy process. We hope our list provided you with some good ideas so you can get off to a solid start, and avoid some of the traps waiting out there. If you've worked for any of these companies at some point in the past, and have an opinion you want to share, please post it in the comments section below. we'd love to hear what you think. Now that you posted the best rated could you provide the worst work at home companies? Additionally rating them with pay, vacation and high turnover? Why? Stick to the list and you won’t need a list of the worst, right?